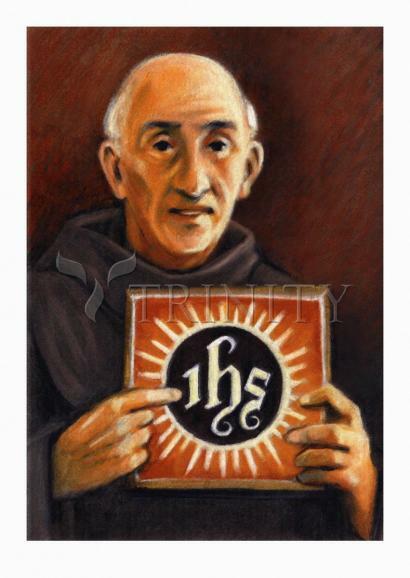 St. Bernadine, the greatest preacher of his time, is especially known for his devotion to the Holy Name of Jesus. The Franciscan priest traveled throughout Italy on foot, spreading this devotion and promoting peace. He persuaded cities to remove their warring factions’ insignia from church and palace walls and replace them with a symbol he devised: the first three letters of the name of Jesus in Greek, IHS, on a blazing sun. While preaching, he would hold a plaque in front of him with this monogram on it, and afterwards expose it for veneration. In Bologna, a card painter, who had been ruined by Bernardine’s preaching against gambling, made a small fortune by producing these tablets, such was their great popularity. Some thought it a dangerous new devotion and repeatedly sought to have the pope silence Bernardine. He was forbidden to preach or exhibit his tablets until his conduct had been examined by a commission. Eventually Pope Martin V not only commended his teaching, but approved Bernardine's election as Bishop of Siena. Bernardine declined the appointment, and later the sees of Ferrara and Urbino as well. With his characteristic sense of humor he quipped that all of Italy was already his diocese. His feast day is May 20. St. Bernardine was born in Massa Marittima on September 8, 1380 where his father Tollo Albizzeschi, in 1377, had been sent as a Governor of the Republic of Siena. Rather young he became an orphan and returned to Siena where he grew up first in the house of his aunt Diana and then in the one of his cousin Tobia. In 1400, at age 20, he gave up his studies at the university in order to help the sick during the period of the great plague in the Hospital S. Maria della Scala of which he was nominated director. On September 18, 1402 he became a Franciscan friar in the Church of San Franceso in Siena; he lived his novitiate in the Colombaio Monastery (Seggiano) of which remain only ruins. In 1406 he received a gift from the Hospital S. Maria dellla Scala the Capriola-hill where he founded the Osservanza-Monastery. In 1417 he began his journeys as the apostle of Italy which he continued until his death. One of the characteristics of his sermons was the devotion towards the Holy Name of Jesus. He loved his home town Siena and it was also he who gave rise to many a good law adopted by the Republic of Siena. In 1425 on the Piazza S. Francesco and in 1427 on the Piazza del Campo he gave two of his famous sermons. St. Bernardine died on the May 20, 1444 at L'Aquila where he wanted to preach. On May 14, 1450 he was canonized by Pope Nikolaus V in the Basilica of St. Peter's in Rome. The presence of St. Bernardine in Siena can be perceived almost everywhere since the emblem with the name of Jesus Christ, whose worship was propagated by St. Bernardine during his sermons, is to be found on the façade of numerous buildings from the most famous like the town-hall and the cathedral to the most humble private houses. Of the painted and gilded disks with the holy emblem, which the saint used to show his spectators and bless them, two originals are preserved up to this very day, the one in the Basilica dell Osservanza and the other in the Oratory of St. Bernardine. These two churches represent the main destinations of a trip in the world of St. Bernardine. The Basilica dell Osservanza was constructed during the last 25 years of the 15th century on a green hill called "Colle della Capriola" on the site of an old hermitage, the latter had been given to St. Bernardine in the year 1404 as a gift. It is an elegant, serene building in pure Renaissance style and ascribed to Giacomo Cozzarelli. (The church was restored in accordance with the original using the same construction materials after its destruction by aerial bombardment in 1944). In the church and in the added monastery numerous keepsakes of the Saint are treasured; e.g., his coat, which is preserved in a reliquary of gilded silver with enamel-paintings made by the famous Sienese goldsmith Franco d'Antonio during the years 1454 to 1461. The Oratory of St. Bernardine which was given its name during the second half of the 15th century, is to be found in the Piazza S. Francesco where St. Bernardine in 1425 held a cycle of his sermons preserved by Sano di Pietro by means of a delightful panel. Another panel shows the sermon in the Campo-Square in 1427. This Oratory is a real shrine of admirable works of art: it is composed of various rooms and his fame is above all due to the frescoes with which Sodoma, Girolamo del Pacchia and Domenico Beccafumi from 1518 until 1532 covered the walls of the richly decorated chapel on the first floor thus creating one of the most beautiful architectural and decorative scenes of the Sienese Renaissance. A visit to the most significant places of St. Bernardine in Siena may not exclude the 13th century seat of the Compagnia dei Disciplinati della Beata Virgine Maria which is located under the vaults of the Hospital Societa di Esecurtori di Pie Disposizioni entrance from the Cathedral square. St. Bernardine entered this company as a young man and it is here where a most wonderful wooden cross from the 14th century is venerated. In front of the cross, according to tradition, is where St. Bernardine received the call to embrace a monastic life. When a fire is lit to clear a field, it burns off all the dry and useless weeds and thorns. When the sun rises and darkness is dispelled, robbers, night-prowlers and burglars hide away. So when Paul's voice was raised to preach the Gospel to the nations, like a great clap of thunder in the sky, his preaching was a blazing fire carrying all before it. It was the sun rising in full glory. Infidelity was consumed by it, false beliefs fled away, and the truth appeared like a great candle lighting the whole world with its brilliant flame. By word of mouth, by letters, by miracles, and by the example of his own life, Saint Paul bore the name of Jesus wherever he went. He praised the name of Jesus "at all times," but never more than when "bearing witness to his faith." Moreover, the Apostle did indeed carry this name "before the Gentiles and kings and the sons of Israel" as a light to enlighten all nations. And this was his cry wherever he journeyed: "The night is passing away, the day is at hand. Let us then cast off the works of darkness and put on the armor of light; let us conduct ourselves honorably as in the day." Paul himself showed forth the burning and shining-light set upon a candlestick, everywhere proclaiming "Jesus, and him crucified." And so the Church, the bride of Christ strengthened by his testimony, rejoices with the psalmist, singing: "O God from my youth you have taught me, and I still proclaim your wondrous deeds." The psalmist exhorts her to do this, as he says: "Sing to the Lord, and bless his name, proclaim his salvation day after day." And this salvation is Jesus, her savior.